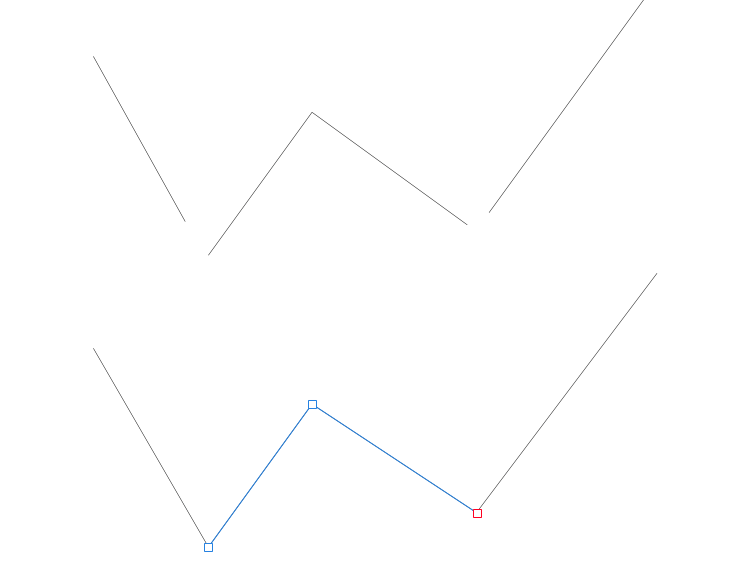 In Illustrator I have live traced/expanded a person's signature and imported it in AD. While cleaning it up, I am unable to join where the line has not connected (imagine the top of a cursive letter L). How can I "merge" two ends of the same object? I will use the vector file to laser cut a piece of wood so I need to work on one layer. I'm a newb to all of this, so thanks for walking me through it! If you want to merge the ends, just drag one end over the other. If both belong to the same shape, Affinity Designer will close it automatically. 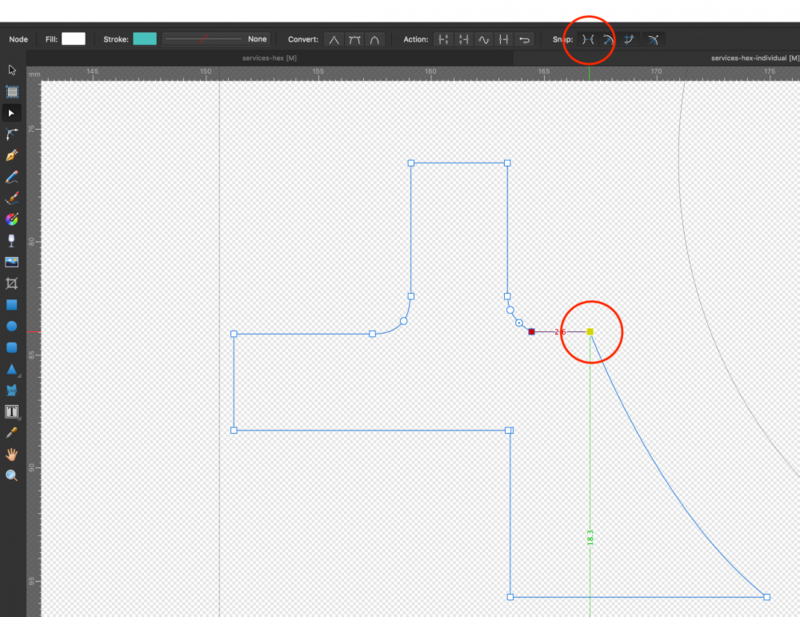 If you want a line joining the two ends, select the shape and go to the context toolbar on top and press Close Curve button on the Action section (second icon). 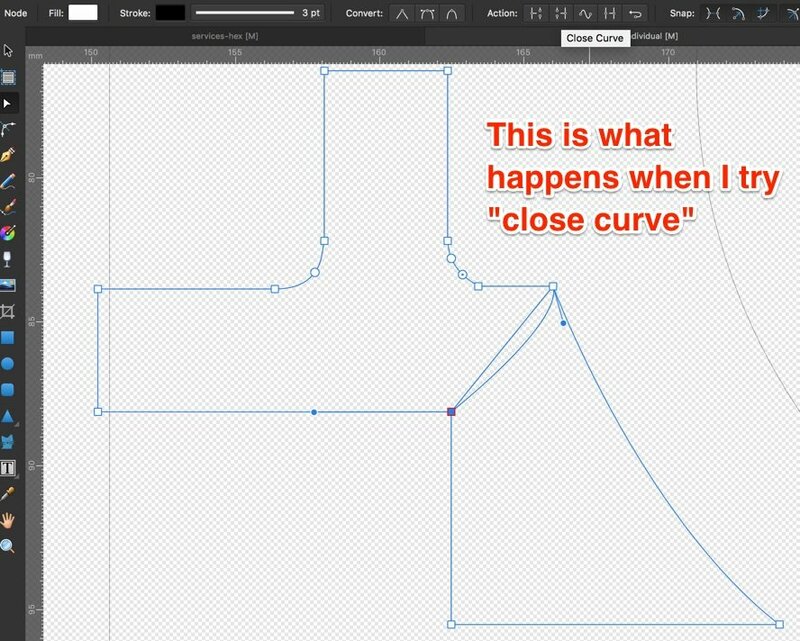 Affinity Designer will add a line connecting the two ends and close the shape. For whatever reason, overlapping the ends does not close the loop for me, nor did the Close Curve button. Your suggestion of adding a line prompted me to draw a line (actually a closed rectangle/trapezoid) which connected the two ends and, when both were selected, enabled the Add button. This worked. If it's not closing the shape automatically it's probably because there's another "open" node somewhere in the shape. Make sure you have Snap to selected curves pressed in the context toolbar in the Snap section. I followed the steps, but it's not working form me. I have 3 lines, one is arc'ed to curve across the two other directional lines. All I want is to join the three lines (maintaining the shape) and it fill it. Some options close out the arc and then add color to some magical line that appears across the arc and the arc itself - never the full shape. What am I missing? Can you post the image again. I'm not able to see it. Actually, creating it as a single shape and not 3 lines, solves my problem. Because these are directional lines, I have to create them twice; the first time to get the directional degree correct and the second time to build the shape to fill. Hi Shaker242, thanks for the image. Select all three lines, change to the Node Tool, enable Snap to selected curves in the Snap section on the context toolbar (the first icon), then drag a node from each corner away a little then back to over the other where it was. You should see a yellow circle or square when both match the same exact position. After doing this for the three corners and with all objects still selected, click on Join Curves from the Action section in the context toolbar (fourth icon). This will join them all creating a closed shape. You can now fill the shape as you wish. I think the yellow box is the trick I was missing. I've now joined the three lines and filled the shape as expected - thank you for your help! Glad to know it's sorted out. Just what I needed ! Thanks. Hi, I'm using the latest version of AD on a Mac and I cannot get three lines to connect to form a single line.. Have used the method described here but no joy. 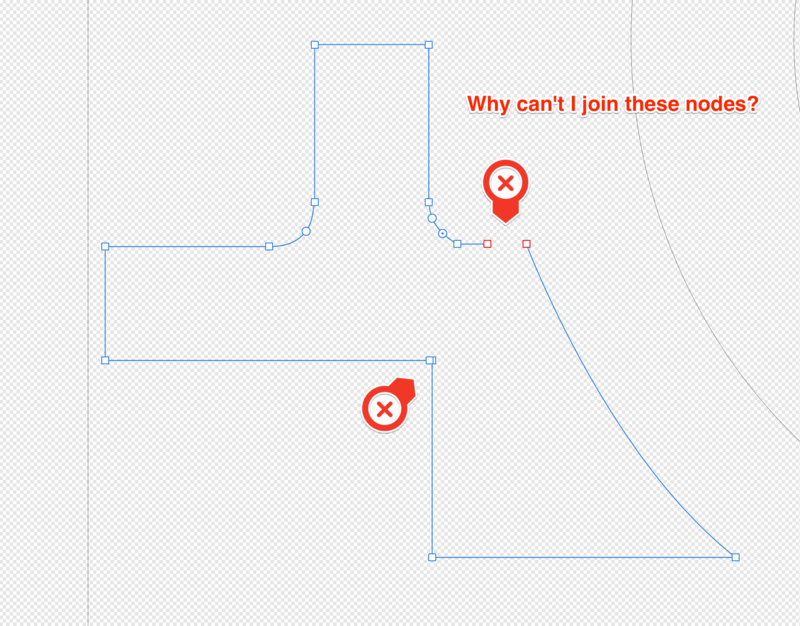 In Illustrator, the command "Path > Join" (cmd-J) does the job with one click. What am I doing wrong ? spinko, if you select all three lines in the Layers menu & with the Node tool active click on the Join Curves action in the Context toolbar, what happens? When I do that with three two node straight lines positioned as in your screenshot, I get a single line with six nodes -- because I did not snap any ends together, I get two segments connecting the gaps between the lines. Check the clip below. Let me know if you still have trouble. I have done this multiple times but for some reason it is not working with this file. I went over all the answers in this post but I still can't connect the lines. This file was printed to pdf in Rhino. In rhino each polygon is a polyline. Some layers have more than a polyline. Affinity Designer merges objects in each layer into a group. Ungroup doesn't separate the several poly lines and if I try to add fill only some get fill. Dividing the group splits the largest poly into lines but then it isn't possible to join them again! I uploaded the original pdf and the resulting file after dividing the polylines. I appreciate this is a very old thread, but I have a recurring problem. I cannot close curves and I cannot work out why. 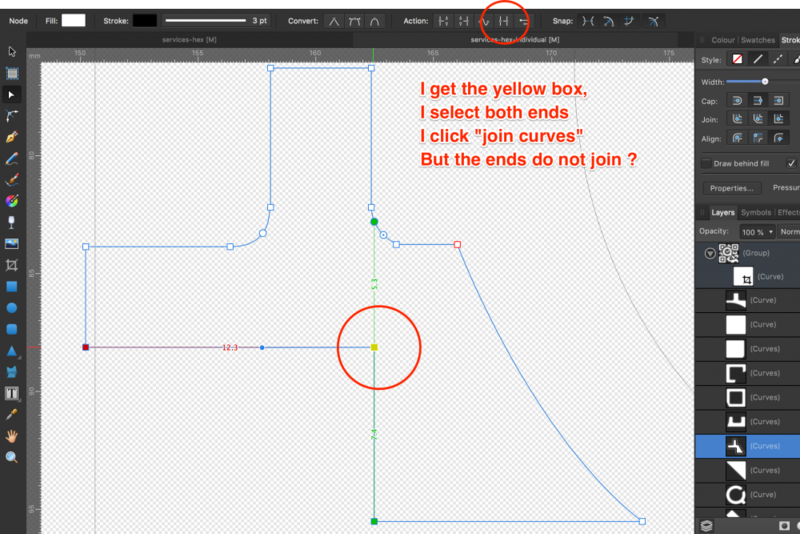 Previously I used Macromedia Freehand and Illustrator, so I expect to be able to select two open ends and then click "Join curves" to connect the selected ends. I have read various Affinity help files, forum threads and user-generated "tutorial" videos, but I cannot understand the Affinity logic... or keep forgetting the Affinity way of doing it because it doesn't make any sense to me. I have replicated everything in the above video and much more besides but I cannot get my lines to connect. What am I doing wrong please. Four screen grabs attached. I have replicated everything in the above video and much more besides but I cannot get my lines to connect. The presence of the two red nodes indicates you have two open curves. So the first step is to use "Join Curves" to convert them into one open curve. 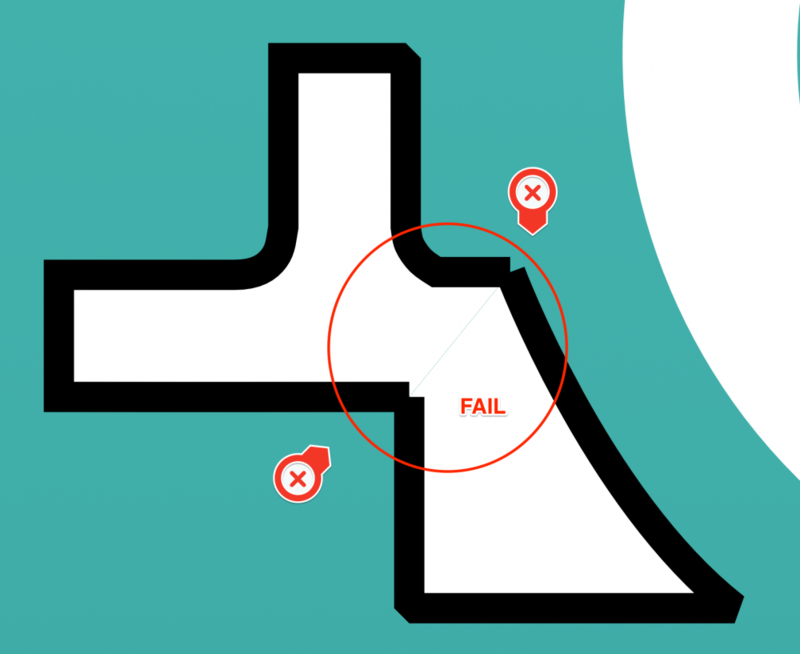 The next step is to use "Close Curve" to connect the open ends. It looks like you are doing this in the reverse order -- if you close the curves first, there will be no open ends to join. Did you first select both curves & use "Join Curves" to join them and then use "Close Curves" to close the gap between them? Yes I tried that but it does not respond as expected. Background info: I first used "Break curves" to re-arrange the shape and then was hoping to join them together in a different way. I guess Affinity can't cope with that. Can you post a screenshot of what you get after joining the two curves but before trying to close the resulting curve? Do this with the node tool selected so we can see the nodes like in your first screenshot. As far as I can tell, nothing happens. I guess my question is, if two ends were once joined, can they ever be joined to any other end? In my experience the answer seems to be "no".